Herbal Aloe Force® Juice is an immune-boosting powerhouse! Due to popular demand, Herbal Aloe Force no longer has Sodium Benzoate as an Ingredient! Among it's over 250 different cofactors are vitamins, minerals, growth factors, essential fatty acids, and polysaccharides. 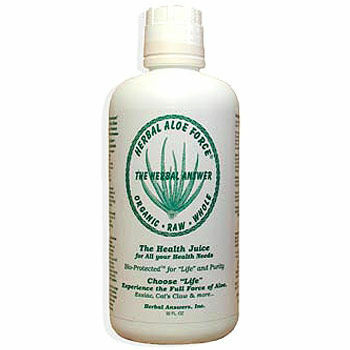 Herbal Aloe Force® Juice has been shown to balance stomach acids, promote healthy tissue linings, and improve digestive function. This Aloe Vera is produced using the patented Bio-Protected™ method of processing, whereby no heat is ever used and no water is ever added. The bitter aloin (laxative) compounds have been removed, and synergistic herbs added for maximum immune-boosting activity. The herbs in the juice, like cat’s claw, pau d’arco, and astragalus were carefully chosen for the healing benefit. 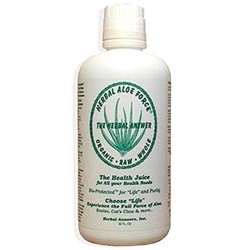 Because Herbal Aloe Force® uses the whole leaf, the juice contains maximum potency while the natural proportions of the aloe vera are maintained. Herbal Aloe Force® contains the classic Essiac herbs. Ingredients aloe vera leaf, cat's claw bark extract, chamomile flowers extract, burdock root extract, hawthorn berry extract, astragalus root extract, sheep sorrel herb extract, pau d'arco extract, slippery elm bark extract, rhubarb root extract, colloidal silver, natural fruit extract.